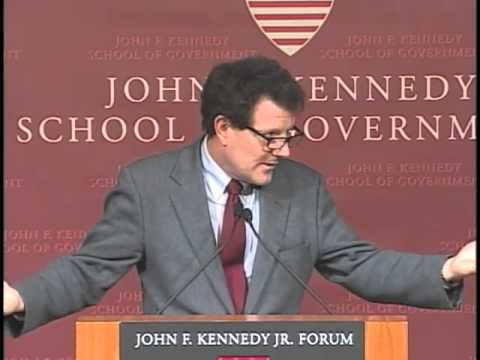 In an ever-more-crowded media landscape, journalists and academics alike must think creatively about how to bring overlooked human rights issues to Americans’ attention, journalist Nicholas D. Kristof ’81 told a packed audience at the Harvard Kennedy School Tuesday. Perhaps no one has tackled the problem so enthusiastically — or with as big a megaphone — as Kristof, a New York Times columnist and two-time Pulitzer Prize winner, who was on hand at the John F. Kennedy Jr. Forum to accept the Goldsmith Career Award for Excellence in Journalism from the Joan Shorenstein Center on the Press, Politics, and Public Policy. In nearly three decades at the Times, Kristof has made a career of detailing how the world’s other half lives, bringing to light public health crises, systemic violence against women, and other global issues while reporting from locations as far-flung as Rwanda and China. But as Kristof made clear in his talk, even a star columnist with a major platform can see that getting Americans to care about, say, childhood nutrition in the developing world or warfare in the Congo is a tall order. Americans’ trust in their media has declined in recent decades, and their interest in other countries’ problems has waned as the United States faces challenges of its own. Since the mainstream media’s business model “seems to be evaporating,” he said, major news organizations are less likely to sponsor international reporting. ABC News, for example, received $1.5 million from the Bill & Melinda Gates Foundation to cover issues of global health and nutrition, but even the financial backing was not incentive enough, Kristof said. ABC declined to renew the deal, he said, because it thought viewers were not interested in such stories. As a columnist, he said, he once thought he would be able to “change people’s minds twice a week” on issues they already cared about. Over time, he realized the real strength of his platform lay in being able to highlight news in places that most Western readers overlook. “I hope we in journalism will continue to recognize that our great power is in laying out an agenda, shining a spotlight, rather than classic punditry,” he said. In bringing human-rights issues to light, journalists must do a better job of connecting with experts at universities, whose wisdom on public policy often goes unheard in favor of pronouncements from think tanks, he said. But responsibility goes both ways, he added. Kristof was among many winners and nominees present at the Goldsmith Awards ceremony, an annual event, now in its 22nd year, that draws an all-star roster of often behind-the-scenes investigative reporters to honor the impact their work makes on public life. Patricia Callahan, Sam Roe, and Michael Hawthorne of the Chicago Tribune received the $25,000 Goldsmith Prize for Investigative Reporting for “Playing With Fire,” a series that exposed a deceptive campaign by the chemical and tobacco industries to put toxic flame retardants into a number of home goods, despite the fact that the chemicals did not work as promised. “The impact of the series has been huge,” Jones said. “Historic state and federal government reforms are in the works, and the debate over toxic chemicals has been reshaped.” As a result of their reporting, he said, the U.S. Senate revived legislation to reform toxic chemical practices, and California moved to revamp its rules on the presence of dangerous chemicals in furniture sold nationwide. The 2013 Goldsmith Career Award for Excellence in Journalism recipient, Nicholas Kristof, of The New York Times, addressed the audience about the current state of journalism in an analysis of both where the field stands today as well as the landscape of its future. Harvard graduate and physics major Michelangelo D'Agostino (left) gives graduate students Yat Shan Au and Tom Dimiduk an overview of the wide-ranging role that data analytics played in Obama's presidential campaign.